There’s a misconception that if you don’t have a plan for every area and every second of your life, that you’re a failure ?or at least headed in that direction. You don’t always need a plan in life. 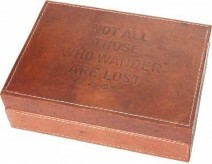 Sometimes, simply taking things day – to – day and moment – to – moment is your plan, and that’s good enough for you..
Be the first to review “Leather Box Wander” Click here to cancel reply.